This paper is concerned with the boundary feedback stabilization of a coupled ODE-Schrödinger system cascades with the external disturbance flowing the control end. The author uses the sliding mode control (SMC) to deal with the disturbance. By the SMC approach, the disturbance is supposed to be bounded only. 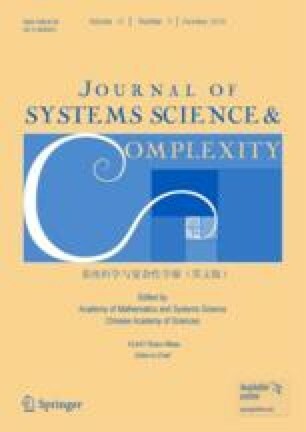 The existence and uniqueness of the solution for the closed-loop via SMC are proved, and the monotonicity of the “reaching condition” is presented without the differentiation of the sliding mode function, for which it may not always exist for the weak solution of the closed-loop system. Some numerical simulations is presented to illustrate the effectiveness of the proposed control. This work was supported by the National Natural Science Foundation of China under Grant No. 11626165, the School Young Foundation of Taiyuan University of Technology under Grant No. 2015QN062, and the Natural Science Foundation of Shanxi Province under Grant No. 201701D221013. This paper was recommended for publication by Editor LIU Yungang.